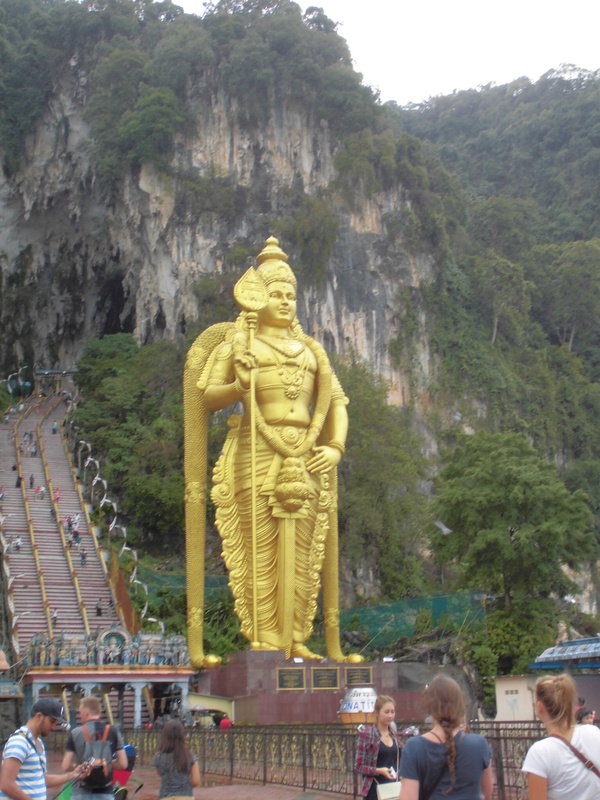 Batu Caves are on most Kuala Lumpur traveler’s lists. The caves are about 30 minutes from the city and can be reached by bus or train pretty easily. The caves are up a limestone hill and are a Hindu shrine and temple. 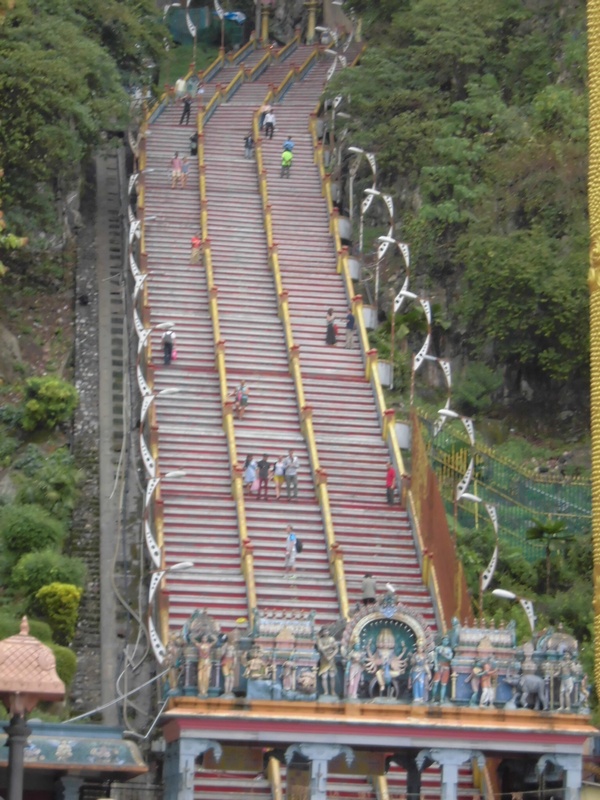 Steps to the Batu Caves. Can you spot Matt? To reach the caves, you must climb 272 steps. I was surprised to see a lot people climbing the steps barefoot. Besides the people who were barefoot, there were also clever monkeys afoot. Although the monkeys are wild they must have been fed by people at some point because they saunter right up to you and eye your bags to see what you’re holding. 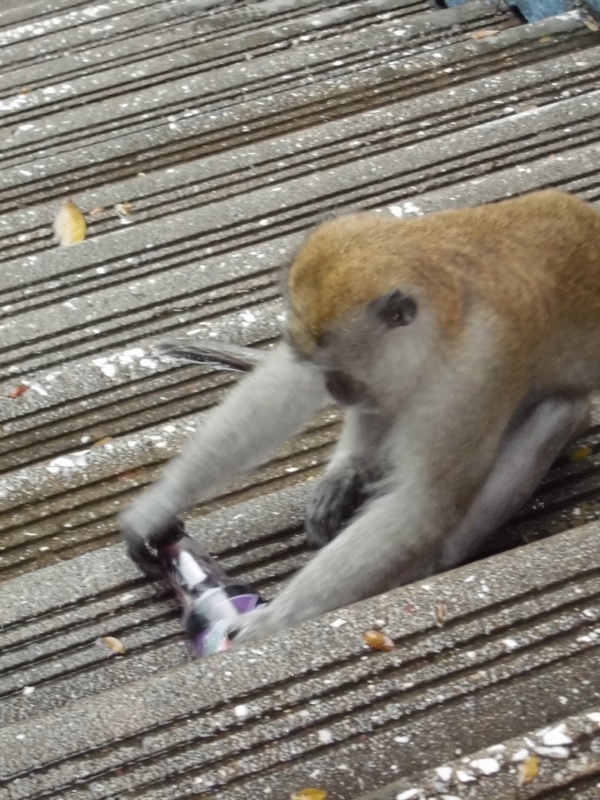 We saw one monkey slowly make his way around a small group of tourists, zero in on the one with a plastic bag and quickly steal it from her, taking it to a high area to check his luck. When it only contained a plastic water bottle, that didnt deter him and he set to work until he quickly had a hole squirting water. We prefer bananas and coconuts. But we will take anything a tourist carries. Beware! We had no intention of feeding these monkeys. … But while Matt was transfixed by a small monkey to his right, this big daddy snuck up from the left and grabbed his soda! After seeing the temple area at the top, we ventured into the “Dark Cave.” This cave used to be open to the public in the ’70s, but as people often do, they proved they can’t have nice things and graffitied the walls and caused damage to the cave. So these days, there is a conservation effort and you can only tour the cave with a tour guide and entrance fee. I may have been less than excited to tour a cave filled with bats and creatures, but Matt talked me into it. I couldn’t believe how easily we spotted all the little creatures our guide told us about, but my favorite part was when we came to a place where no natural light gets in and turned off our lights, plunging us into total darkness! Your eyes can’t adjust at all to the darkness, so we couldn’t see our fingers right in front of our faces. 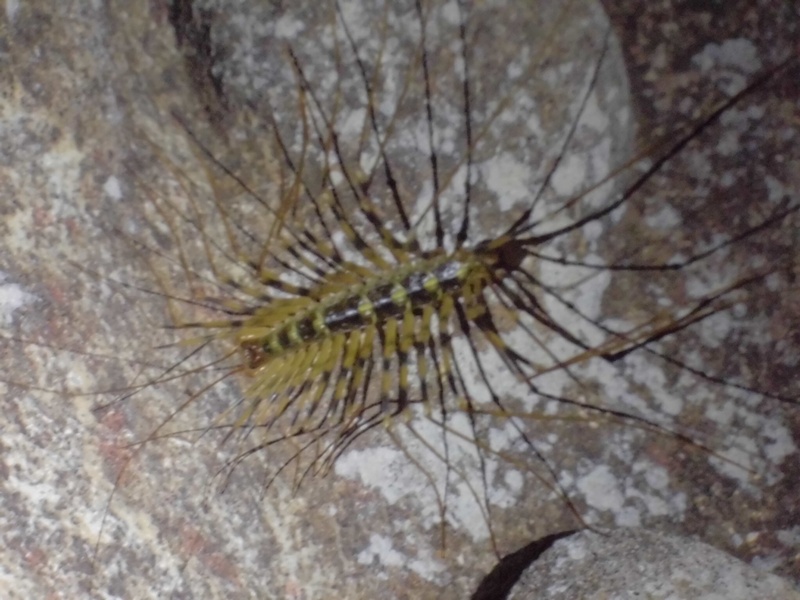 A long-legged millipede in the Dark Cave. Tags: Batu Caves. Bookmark the permalink. Exciting! Glad you got to go there. 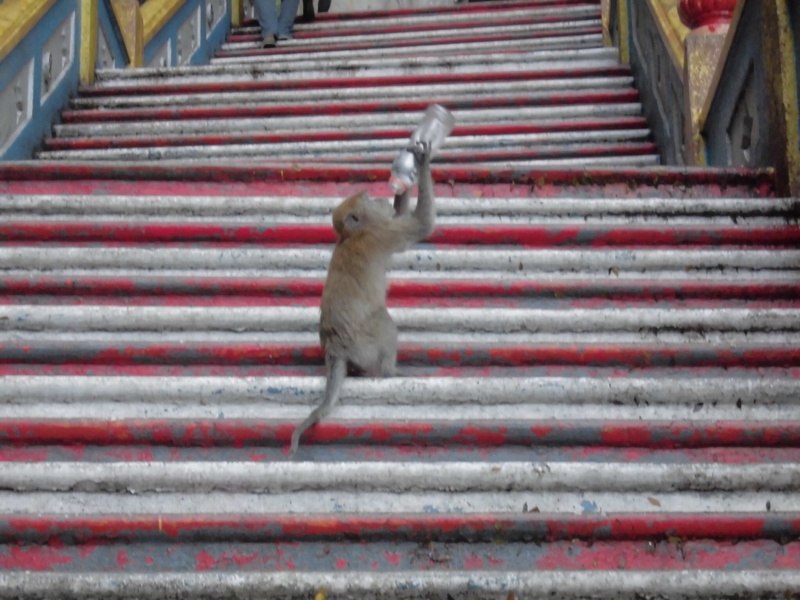 I honestly forgot about all the steps (I must have been in much better shape when I went than I am now…) but loved seeing the monkeys everywhere, even inside the cave up on the shrines, etc. Can’t wait to talk to you guys about this one….looks like an awesome place to visit and explore!